As a "Winter Wonderland", Watersmeet is gateway to the north’s Big Snow Country. 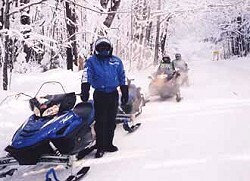 We have professionally groomed cross country and snowmobile trails, along with fine winter lodging and dining. No matter what your tastes, whether they be outdoor sports and wildlife, family vacations, or solitude. The groomers are reporting early spring conditions today on the Watersmeet trails. We've had snow for the past four days throughout the days, but it's not enough new snow for the groomers to work with on the trails and grooming has been suspended. They report that they will groom again if we get 5" or more of new snow. They report the following conditions on our trails: Trail 2 west of Watersmeet: Icy and fair for 12-15 miles and then it turns good Trail 2 east of Watersmeet to Trail 107: Fair with dirt and rocks mixed in the snow till you get out of town Trail 3 north of Trail 2 to Bond Falls: Fair with icy corners Trail 3 North of Bond Falls to Trail 8: Good Trail 3 south of Watersmeet to Land O' Lakes: Poor - lots of dirt and rocks mixed in with the snow Trail 13 south of Trail 2 towards the Cisco Chain: Good Trails are rideable. It's just that they can't groom till we get more snow. The predictions right now are for temps in the low to mid 40s on Saturday followed the next two days with snow. Temperatures will then get back to cold again for the next week. If you want a live up-to-date report, please call Caryl at the Chamber at 906-358-9961 or email me at visit@watersmeet.org. We invite you to visit our website at www.watersmeet.org for lots of information on the Watersmeet area. If you would like brochures or trail maps sent, please forward your name and address to our email. Thank you for visiting our page. We hope to see you soon! My reports have not been going through, but it's not because I haven't been trying! I will keep this short to see if it will post. All Watersmeet trails are being groomed daily or nightly and are in VERY GOOD shape. Trail 3 south from Watersmeet and Land O' Lakes does have some gravel coming through, since there is less snow on that end. It's a great time to come up! Call Caryl at the Chamber number, 906-358-9961 for live up-to-date reports or for help with accommodations. Thanks for visiting. See you soon for awesome sledding! Hi Everyone ~ Our trails are being groomed daily or nightly. They are reporting Trail 2 east of Watersmeet as good to excellent; Trail 2 west of Watersmeet as good to excellent; Trail 13 south is good to excellent; Trail 3 north is excellent; Trail 3 south has been having lots of traffic and is reported as good. We've been having temps up to almost 30 below zero in the past week at night. That and the new snow has been a great help with the trails. However, the upcoming weather predictions starting tomorrow are for temps anywhere from 32 tomorrow to up to 44 degrees in the next week or so. Nighttime temps will be 9 to 22 degrees, so if all goes well, they will be able to groom at nights. Early or late sledding will likely be the best. We always know that weather changes here quickly, so maybe we'll dodge this bullet of warmer temps. As things change here, I'll update. If you want to make a quick trip up, we have openings right along now. Just give us a call at 906-358-4390 or 715-360-6650 (or text the last number). We want to help you with your upcoming sledding vacation. Please visit our website at www.thearrowsresort.com for more information and pictures on our great homes here on Thousand Island Lake here on the beautiful Cisco Chain in Watersmeet. We are just four miles over the Wisconsin border and where the snow is. :o) Thanks so much. Safe and happy sledding!